Word-of-mouth. Probably the only true form of organic marketing that has been there since the dawn of time, and is still going strong. No matter how earth-shattering your new growth marketing strategy is, at the end of the day, consumers crave validation from their peers before making a purchase decision. They wouldn’t trust the glossy marketing promos and retargeting attempts, but they’d place their faith on their friend’s recommendations. Granted it stands true more for B2B buyers than their B2C counterparts, but it can’t be denied that people are 4 times more likely to buy when referred by a friend. This (and several other equally valid reasons) contribute to the hypothesis that brands need to incorporate referral marketing into their outreach campaign. You reach out to thousands of prospects every day – people who are either unfamiliar with your brand, or have never considered your product. That alone takes up a lot of your resources. Only a handful of these leads convert into customers. That’s unavoidable, we’ve come to terms with that. It’s not an easy feat to win their trust and turn cold leads into paying customers (tell me about it). Consider this, wouldn’t it be cost-effective to empower your brand loyalists to spread the word for you? Now, don’t underestimate the potential reach of a happy customer. They can be the most powerful marketing tool if you can figure out whom to approach and when to approach. True that. They are your brand’s unofficial spokesperson – they can persuade their friends and family to at least evaluate your product. A little appreciation or a fitting incentive can motivate the satisfied customers to go out of their way and recommend you to their peers. On the other hand, the referred customers will be less skeptical and more enthusiastic to give your product a try. If you manage to delight them with your superior product and best-in-class support, they’ll be more than willing to act as brand advocates themselves! You can request your happy customers for referrals via a number of channels, some undoubtedly more effective than the others. We’re going to focus on how you can harness the power of email to drive quality referrals. In other words, your consumers expect emails from you, and chances are they will give it a read if it promises offers or discounts of some sorts. Email is the least intrusive of the bunch – buyers have opted-in to receive mails from you, so it’s fair to assume that they won’t mark it as spam. You are just casually reaching out and letting them know of a great deal that you think they’d love. No pressure. 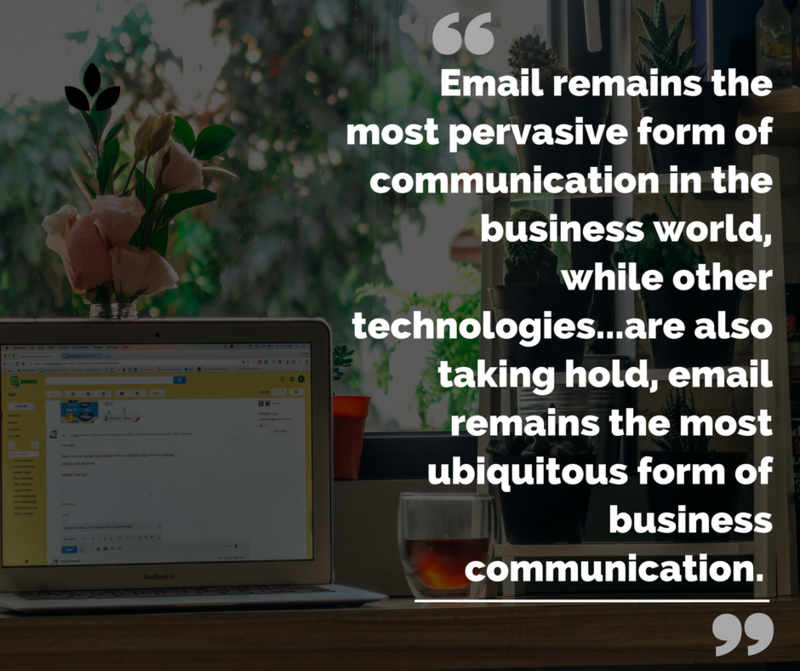 Especially for B2B consumers, email is the most efficient communication channel. They are already in the nurturing stage and would want to extract more value from the product. Also, they’d much rather prefer receiving product updates or marketing promos via emails as it wouldn’t interfere with their workflow. It wouldn’t do much good to assume that if you launch a referral program, your customer will start referring immediately. You have to make them aware of the program and politely urge them to take part in it. You can amplify the reach of your campaign by spreading the word through social media platforms, but it won’t be a targeted program. It’ll be open for all of your customers, not just the happy ones. That can increase the chances of fraudulent activities, and the leads generated may not be of high-quality. Moreover, some people try to avoid sharing a brand’s marketing post on their personal profiles. Even if they do, they might just want to limit the number of referrals to their close friends. In such scenarios, email makes it easier for people to refer single/multiple friends through any of their preferred channels. The key is to send the referral request at just the right moment to the regular customers who have been actively engaging with your brand and are satisfied with the services. Email lets you specify that moment (we’ll get into that shortly, sit tight). It’s not just us, companies with referral marketing programs in place consider email marketing as the most effective customer acquisition channel. 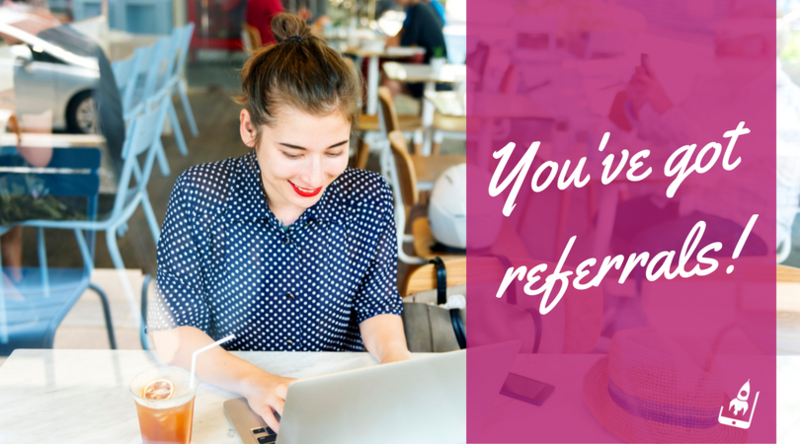 Let’s talk about how you can ask for referrals via emails. A persuasive referral email consists of a number of components that play well together. You have to pull the strings carefully so that it stands out from the rest of the promotional emails that flood our inbox on a daily basis. Your referral emails should be concise, compelling, and most importantly, charming. You are not only asking for referrals, you are also asking your customers to trust you enough to recommend your brand to their close friends. Your emails should reflect that intent. What’s the first element you notice when you scan through your inbox? Can we interest you in a too-good-to-be-true referral offer? Refer your friends, and your next trip is on us! Show your friends some love by gifting them awesome discounts! Tell some friends about us, we’ve got amazing free stuff to give away! Keep the email copy simple, self-explanatory, and eye-catching. The value proposition should be at the top of the email and highlighted to attract attention. Tell them what you are offering clearly, and how both the referrer and the referred will benefit from it. Uber Eats knows a thing or two about ‘eye-catching’ emails. Once you manage to tear your eyes away from the header image, you’d notice how they’ve laid out the instructions clearly. Clean and clever. Stick to one clear CTA. The sole purpose of the email is to get them referring, and that should be the only action your readers have to take. Avoid making the email looking too spammy with too many gated links. 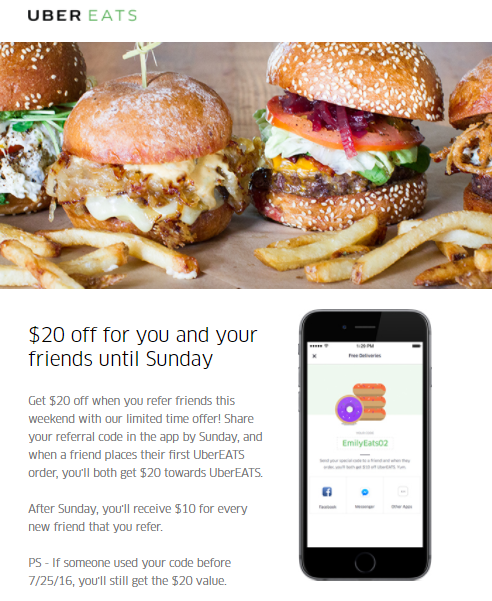 Your customers should be able to refer their friends immediately. Give them personalized links instead of forcing them to sign in and jump through hoops to get it done. They’ll procrastinate and eventually, forget about it. The email should look legit; it should align with the brand’s voice and color palette. If your readers don’t trust the authenticity of the email, they’ll be skeptical of providing any data to continue the referral chain. Be crystal clear with your terms and conditions. Hidden conditions under an * may make the buyer feel cheated. For example, if the referred has to spend a certain amount to be applicable for the referral program, let them know. 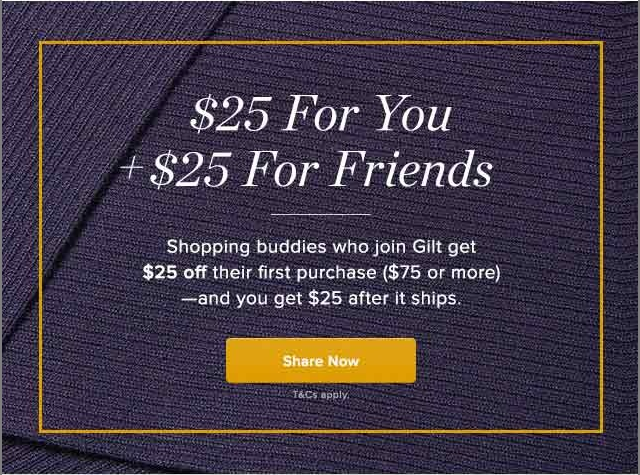 Take a look at Gilt’s referral email (or a part of it) here. Email is first opened on a mobile device 51% of the time, and that number is rising. Hence, ensure that your email is optimized for mobile devices as well. If you’re offering tangible rewards, include the snapshots of the products in the referral email. Let the readers know what they’re about to receive in exchange for a few referrals. Create a level-up referral program to keep your customers hooked, in hopes of better rewards. For example, you can set up enticing rewards for those who refer 10 friends and then ask them to refer 10 more to receive a separate set of rewards. The rewards may get increasingly interesting according to the levels. Show them what’s in store for them as they refer more friends. 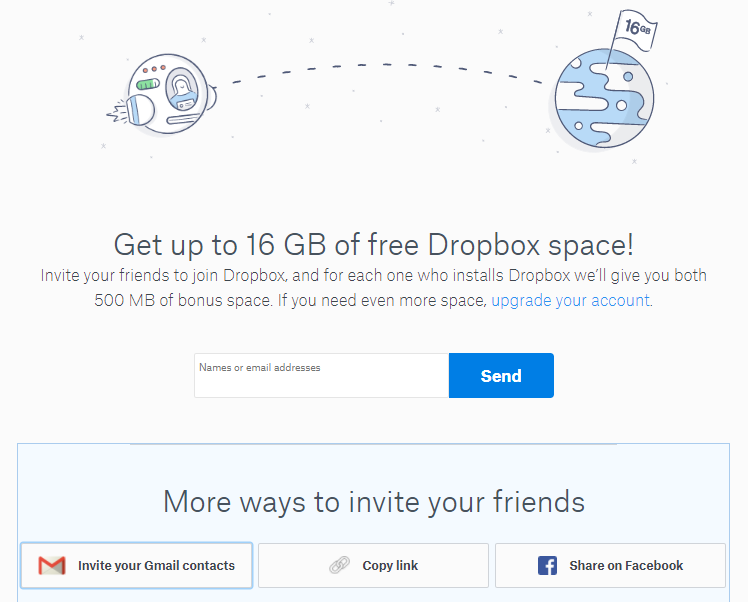 Your customers should be able to invite all of their friends in one go. They shouldn’t have to hunt for emails or phone numbers elsewhere. Take for example Dropbox’s referral page. They make it easier for referrers to just import the email IDs and send the referral code. To avoid discrepancy, the referrers should have a tracking link in the email to follow-up on how many of their referrals converted to customers. However, even if you have it in place, let them know when a referral converts. Thank them personally and encourage them to refer more. The concept of reward varies a bit when it comes to B2B consumers. You have to dig deeper to find out what resonates with the majority of the buyers – if it’s monetary reward, exclusive features, beta-testing opportunity, product discounts, or maybe, gift cards. 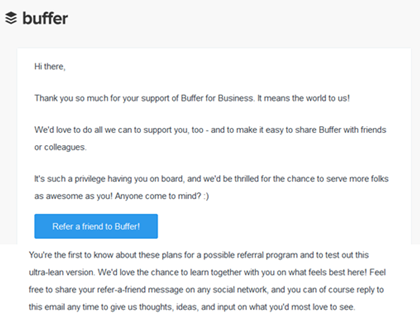 Buffer straight up asks its users for inputs. Their referral email is personal, persuasive, and just exudes good vibes. 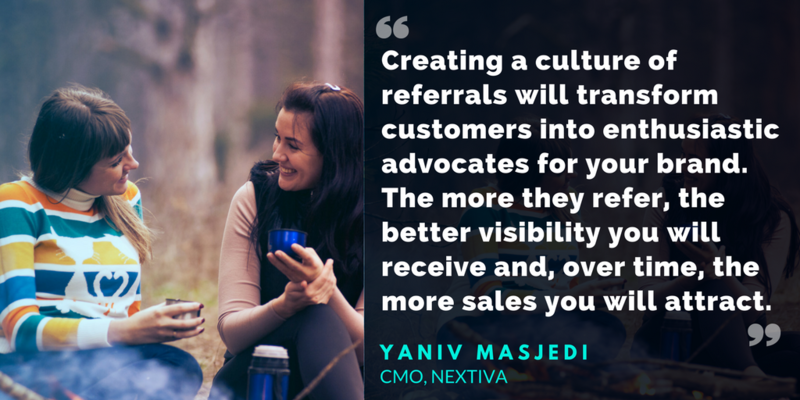 B2B consumers will only refer those industry peers who can benefit from your product. That’s their primary motivation, and they expect that as a brand, you’d value that commitment. Hence, the promised rewards should be dispatched immediately, and the whole onboarding process should be on point. Then again, rewards are not the only thing that matters in a referral program. The brand message, the immediacy of it, the timing, and the user intent all play very specific roles in a well-planned campaign. Understand your customer’s intent, their expectations and draft the email accordingly. Your customers are placed in various positions on the nurturing funnel based on their relationship with your brand. A referral request sent at the wrong time of the consumer journey will do more harm than good. Engage with each prospect differently, based on your past interactions, and their emotional attachment to your brand. Offer comparatively newer customers one-time discounts or ‘welcome deals’ to boost their excitement and push them to become advocates. At the same time, strengthen the bond with your existing happy customers by making them feel special. Personalization matters, as your customers don’t want to receive a generic mail that triggers no emotion from them. Segregate your audience as per their commitment to your brand and customize the message accordingly. Create dynamic content and use the customer data to display the products that have caught their eyes in the past, and use those as anchors to draw them in. Target the ‘right’ customers to maximize the ROI of your campaign. They can be the ones who gave you a good NPS rating, the brand loyalists who are return customers, those who engaged with your brand on social media, or those who gave you good reviews on review sites. As for the ‘right’ time, it’s better to reach out to your customers when they are particularly happy with your product/services. That can mean after a successful transaction, or after a positive interaction with your brand. You can personalize the messages based on the actions taken by the satisfied customers. For example, you can target post-purchase or confirmation emails to request for referrals. Other than that, you can send referral requests via shipping emails, post-delivery confirmation emails, or post-customer service mails. Along with these targeted emails, you can also design a separate marketing email that you can send out to your happy customers periodically to ensure maximum reach. Including a request in the welcome email just after the user signs up is a bit risky. It can irritate them as they haven’t yet had a chance to try out the product yet. But that varies from product to product. 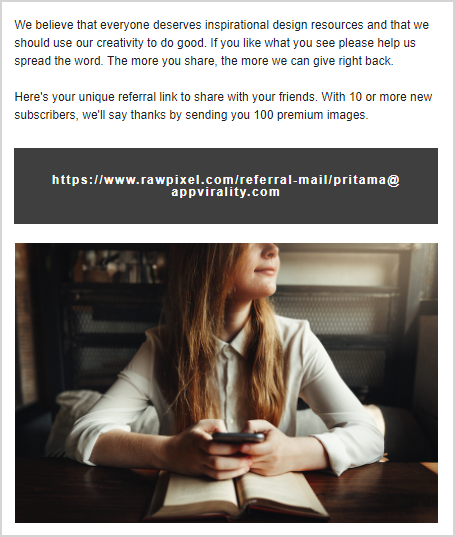 Rawpixel introduced their referral campaign in the introductory email itself. This strategy works for them, as users generally sign up just to get access to high-quality images, and 100 free exclusive premium images as a reward for referring 10 friends sounds motivating enough. Mylo’s got referral marketing figured out. 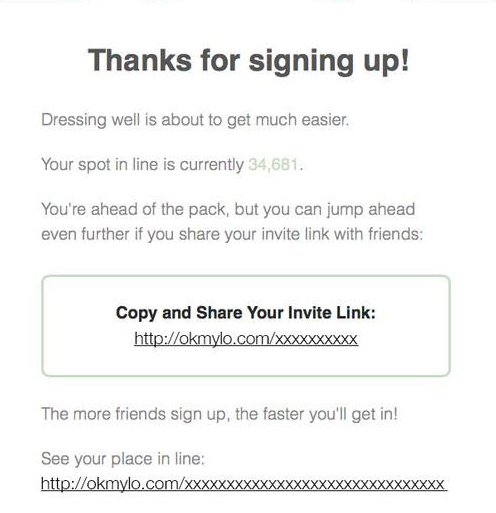 The sign-up confirmation mail is not really asking for referrals, it’s just casually pointing out that if you want to get ahead in the line, invite more friends. It’s for your own benefit, really. Be creative, be witty, but most importantly, be timely. It doesn’t matter if you’re the new kid on the block, or a veteran brand with a cult following, you can’t force anyone to recommend your product to their friends. However, you can enrich the experience of your existing customers through multiple touchpoints that’ll compel them to do so. Email lets you track, follow-up and personalize content for individual customers, and that’s invaluable when you’re promoting your product via brand enthusiasts. 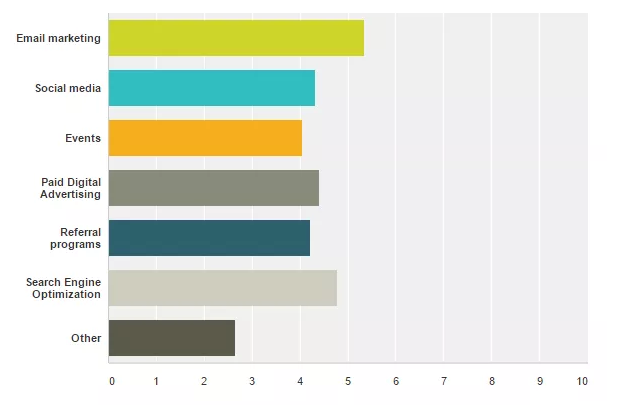 What’s your preferred channel to drive referrals? Let us know! Email campaign always help generate business provided it must strategized aligned to your business offerings and killer subject line make user to open the email and read it for once. Now rich email content force them to come to your website and make purchase. We are one of the best digital marketing agency (www.technobrains.net).